Animal Place’s Food for Thought campaign, which works to promote veg policies for companion animal, wildlife, and environmental organizations, has two new programs to encourage vegan events! Nonprofits that are holding an all-vegan event for the first time can get up to $1000 of their food costs reimbursed. And for catered galas, Food for Thought is encouraging orgs to add a vegan option that can be selected in advance at half price. Animal Place will pay the other half, up to $1000. Alberta Spay Neuter Task Force (ASNTF), which helps reduce companion animal overpopulation in Canada’s First Nation communities, was the first recipient of an event grant. Their Volunteer Appreciation Luncheon for 60 people provided a colorful variety of vegan dishes that drew rave reviews from attendees. Like ASNTF, animal shelters, SPCA's, humane societies, wildlife rescues, and environmental groups increasingly see it’s ethically inconsistent to serve some animals as food while protecting others. 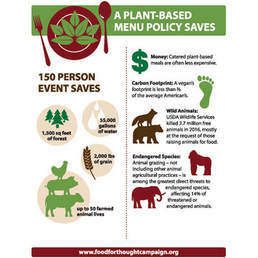 To date more than 350 orgs in North America have adopted animal- and earth-friendly menu policies. Along with helping volunteers and employees promote vegan policies within their orgs, Food for Thought partners with outside groups such as the Center for Biological Diversity to raise the issue of animal agriculture’s impact on the planet. Note these grants are only available for orgs that do not already have an official policy of serving vegan meals at events like fundraisers and conferences. Those interested in applying for a grant can learn more here. Food for Thought also continues to offer Policy Grants for adopting a formal veg menu policy. We recognize that this compiled list only includes unpublished groups relating to our industry, but the quantity of removals over the last few months appears to be more than coincidence and quite possibly targeted. We also recognize that Facebook's reason for removing the Cowspiracy account may be completely unrelated, but their refusal to provide any sort of explanation is suspect in and of itself, and gives us no other recourse but to seek answers based on the information available to us. "Though Facebook is fairly secretive about precisely what makes certain content so offensive it requires removal from the platform, content deemed to be “violent,” “dangerous,” or promoting “terrorist activity” falls within that category. However, these designations are often vague and subjective, and this renders them open to abuse. Because animal rights activists threaten corporate profits by exposing the horrors of factory farming and other forms of systemic animal exploitation, animal industry groups and their allies at the FBI have long sought to cast animal activists as terrorists. Indeed, largely as a result of heavy lobbying from industry, in 2004, the FBI classified the animal rights and environmental movements the number one domestic terror threat in the United States. This is despite the fact that neither of these movements has ever once physically injured a single person in this country. Big Ag and other animal industry groups have subsequently exploited this preposterous designation to marginalize animal activists whenever possible. It is entirely plausible that industry groups successfully pressured Facebook to remove Cowspiracy’s page by falsely reporting Cowspiracy for alleged promotion of so-called animal rights terrorism. Relatedly, as a result of Freedom of Information Act (FOIA) requests submitted by the transparency organization Property of the People, we know Big Ag groups are aggressively monitoring and seeking to silence pro-vegan and pro-animal social media efforts. For example, documents Property of the People obtained through FOIA reveal the USDA’s Cattlemen’s Beef Board and the National Cattlemen’s Beef Association identified Cowspiracy as a potential “crisis,” were “closely monitoring the social media conversations” about Cowspiracy, and strategized about how to counter Cowspiracy’s social media influence. In like vein, the USDA’s National Pork Board monitored Cowspiracy’s tweets, as well as those of celebrities endorsing the film. Other documents the organization obtained through FOIA reveal the U.S. Farmers & Ranchers Alliance sought to prevent plant-based companies from using Twitter handles containing the term “clean meat.” And a previous FOIA request of Property of the People’s exposed unlawful collusion between the USDA and Ag industry groups conspiring against the plant-based food tech company Hampton Creek, including a heavy focus on limiting Hampton Creek’s social media reach. As a concerned community rooted in transparency and truth, we ask that you use your voice and write to Facebook, demanding reinstatement of our Cowspiracy Facebook page. "Regardless of how and who the instigators were that took the Cowspiracy page down, we will be unyielding in our quest for re-publication, for a liberated voice." GRASS VALLEY, and SAN FRANCISCO, CA – Animal Place and the Center for Biological Diversity today announced they are teaming up to call on environmental organizations and conferences to adopt earth- and animal-friendly menu policies. The Animal Film Festival (AFF), a program of the Center for Animal Protection and Education (CAPE), based in Grass Valley California, will be awarding a total of $15,000 to winning filmmakers during the 2018 event. Amber and Adam Tarshis, founders of the Tarshis Foundation, are donating the funds to make these awards possible. $10,000 will be divided among winning films in these categories: Best Feature, Best Short, Best Student and Best Teen. In addition to these prizes, the Tarshis Foundation in partnership with the AFF will also award a total of $5,000 to winning shorts between :30 - :90 seconds long that creatively and convincingly highlight the issues of animal suffering in modern farming, food production, and/or laboratory research, and provide messages that influence people to pursue a more plant-based lifestyle. With over 3,000 film festivals around the world, very few have the means to provide cash awards to filmmakers. The Animal Film Festival is a niche fest in that all the films accepted and screened must explore any aspect of animal welfare, animal rights, the human/animal bond or demonstrate ways to improve the lives of animals. Cash awards to winning filmmakers will increase the relevance of the AFF and could inspire more filmmakers to tackle these issues. It will result in increased awareness about animals, their stories and challenges, and bring to light opportunities for people to help. Each year during the AFF, filmmakers take the stage after their films screen, further educating audiences about what they can do to can help: signing petitions, volunteering at animal shelters, adopting an animal, sponsoring animals, adopting a plant based diet, etc. The AFF also has a streaming channel on ROKU where many award winning features and shorts about animals can be viewed. The AFF goes on tour to cities throughout California and beyond, further enlightening audiences on the joys animals bring, the challenges they face, and the responsibility we all have to protect them from suffering. The 5th annual Animal Film Festival will take place Saturday, February 17, 2018 at the Center for the Arts, 314 W. Main St., Grass Valley, CA. Doors open at 9:30 am, and the first film begins at 10:00 am. 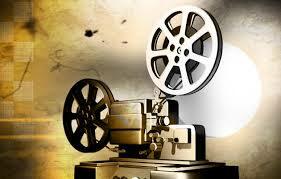 Films will screen through 10:00pm with three Intermissions throughout the day. Tickets begin at $25 for all day admission; $20 senior/student/military; $10 for Evening Session only. Tickets are available at www.animalfilmfestival.org. The Center for Animal Protection and Education (CAPE) (www.capeanimals.org) works to save the lives of individual animals and to educate people about ways in which they can alleviate animal suffering. Founded in 1992, CAPE has helped thousands of animals. Those who are older, injured or recovering from an illness are placed into new, loving homes through CAPE's foster and adoption programs. In 2012 CAPE established the CAPE Animal Sanctuary in Grass Valley, California, a permanent home for dozens of animals with special needs and burros removed from their native habitats on public lands by the U.S. Bureau of Land Management. In 2016 CAPE co created Muttopia, a shelter in Santa Rosa that serves as a safe place for rescued dogs. 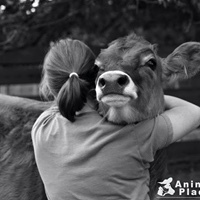 CAPE programs teach that all animals have the right to a long, full life, free from pain and suffering. To learn more or donate please visit www.capeanimals.org. Thanks in large part to Cowspiracy, we’ve learned of the devastating effects of animal agriculture on our planet. We’ve also learned of the reluctance of many nonprofits to be part of the solution. Now, thanks to the Gregory J. Reiter Memorial Fund, Animal Place’s Food for Thought program is offering grants to environmental and wildlife groups that adopt meat-free menu policies for sponsored events. Through our recent petition to urge animal and environmental groups to take animals off the menu at events, we’ve shown that the public supports this change in food policy. With the help of other advocates, Food for Thought is putting pressure on nonprofits to do their part in recognizing plant-based eating as a viable strategy for reducing our environmental impact and toll on wildlife. The new Food for Thought grant provides an important incentive for groups to walk the talk. When farmed animals are on the menu at nonprofit functions, it sends a mixed message to members and donors, as the very species and ecosystems these organizations are trying to protect are harmed by the industries behind the food they serve. As leaders in their communities and movements, nonprofits are better positioned than anyone to lead their members toward more ethical and sustainable food choices. Please take action by signing the petition and by joining the Food for Thought Advocate Network for more information on how to encourage your favorite nonprofit to create a menu policy consistent with their mission. Put your compassion into action and join Animal Place’s Internship Program! Animal Place is one of the oldest and largest farmed animal sanctuaries in the country, and our residential internship program provides an amazing opportunity to live and work at our 600-acre sanctuary in Grass Valley, California. 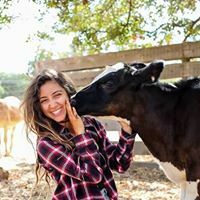 Interns learn all about the operations of a nonprofit sanctuary, the behavior of farmed animals in a non-production setting, and enjoy working alongside like-minded people. On October 10th, 2017, the Los Angeles County Democratic Party moved to pass a resolution titled, “Animal Agriculture and Our Environment," unanimously with no opposition! The resolution in it’s full form will be delivered to Governor Jerry Brown, Dr. Barbara Ferrer, Director of Los Angeles Department of Public Health, Karen L. Smith, MD, MPH Director & State Public Health Officer and Karen Ross, Secretary of California Department of Food and Agriculture and the State Superintendent of Public Instruction of California, Tom Torlakson. This accomplishment is monumental and so important to the environmental protection and animal rights movements. The Los Angeles County Democratic Party is the largest Democratic Party in the United States, representing over 2.2 million Democrats. Across this country, Democrats look to Los Angeles to lead the way in protecting our planet! So not only does the resolution passing mean that the party recognizes the resolution to be true, but it also means that it is a party value! BE IT FURTHER RESOLVED to promote much needed further education on this issue we shall communicate this resolution to Governor Jerry Brown, Dr. Barbara Ferrer, Director of Los Angeles Department of Public Health, Karen L. Smith, MD, MPH Director & State Public Health Officer and Karen Ross, Secretary of California Department of Food and Agriculture and the State Superintendent of Public Instruction of California, Tom Torlakson. Thanks to Cowspiracy, there is increasing awareness of the devastating effects of animal agriculture on our planet.